The BioAge BioSuperfood (BSF) formulas are whole food products composed with four of the most nutrient dense algae found on earth. Each formula delivers a different nutritional value. The products are presented in vegetable capsules that are easy to swallow and practical to use. Balanced natural steroids and hormones. 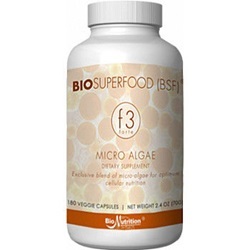 BSF formula F3 offers advanced nutritional support for the immune system, increased vitality for healthy aging; it is also recommend as a replacement of some supplements and vitamins and as an advanced nutritional support for athletes.